Constructed in 1624, it was rebuilt recently. Also a starting point for the Nagasaki Kaido Road, the bridge was used for many years by feudal lords travelling back and forth between Tokyo and their outlying residences and people buying foreign cultural relics and other products. It was also used as a bridge which connected Nishi-guruwa where many samurai lived and Higashi-guruwa where many townspeople lived. During the Edo Period, this was the entrance and exit for the Nagasaki Kaido Road which was used by feudal lords of various Kyushu domains, Nagasaki magistrates, foreigners, and even elephants taken to Edo. It is said that it remained open regardless of the time of day or night and was guarded by several feudal retainers at all times. Magari-no-Matsunamiki in Kurosaki still retains traces of the pine and cedar trees planted on all main roads throughout the country by the Tokugawa shogunate during the Edo Period. 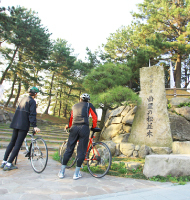 Up until around 1945, a large number of pine trees remained on the Nagasaki Kaido Road from Kurosaki to Koyanose. Today, however, the rows of pine trees in Kurosaki are the only traces of the Nagasaki Kaido Road remaining today. 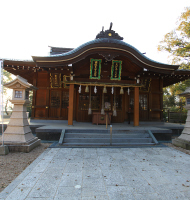 Located in the Kurosaki district in Yahata-nishi Ward, Kita-Kyushu City, Fukuoka Prefecture, the shrine is also known as the Kasuga-gu Shrine and Kuroda Shrine. It has attracted a lot of attention as the shrine enshrining Kuroda Kanbei and Kuroda Nagamasa, two famous historical figures, and the 24 Kuroda Cavalries. 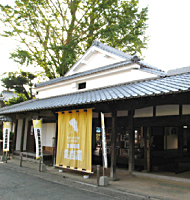 The Ichoya is a rest stop between Kurosaki-juku and Koyanose on the Nagasaki Kaido Road of the Edo Period. It was built at the very top of a stone hill, so steep that many a feudal lord getting down his palanquin to rest there. It was named because of the gingko trees (“icho”) in its famous garden. As a general rule, ordinary people were not allowed to rest here, as it was rest stop reserved exclusively for feudal lords. There is a record of Ino Tadataka, a famous surveyor and cartographer, stopping there for lunch, although he did not lodge there. 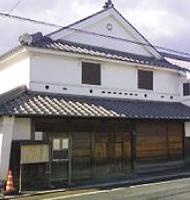 This is the birthplace of Ima Harube, a trailblazing playwright and poet famous for his literary work “One’s Three Next Neighbors.” It was designated as a Tangible Cultural Property by Kita-Kyushu City because of the significance of the way station architectural style of the late Edo Period. 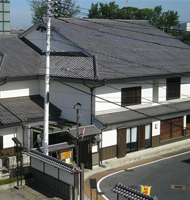 Koyanose prospered in the Edo Period as one of the Nagasaki Kaido Road’s six way stations towns in the then-Fukuoka Domain and was called Chikuzen Mushuku. 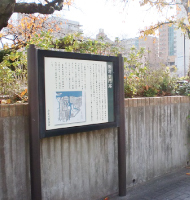 It is home to the Michino Kyodo Archives where you can learn all about the history of the Nagasaki Kaido Road. You really should try to drop there at least one. 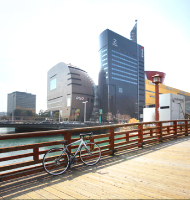 Copyright (C) 2014 smart cycle life kitakyushu All Rights Reserved.